Bow down before your new king, because the full-length trailer for Kong: Skull Island has arrived! King Kong has been a staple of cinema for decades and is second to none (well, maybe one), but this is going to be the biggest of the big and baddest of the bad versions of Kong over put to screen. This new trailer gives us our best look at the terrifying beast yet. The official Twitter account for Kong: Skull Island has been teasing the reveal of this new trailer all week. They have been posting choice bits of footage in daily countdown videos, as well as boasting their new slogan for the movie; All Hail The King. 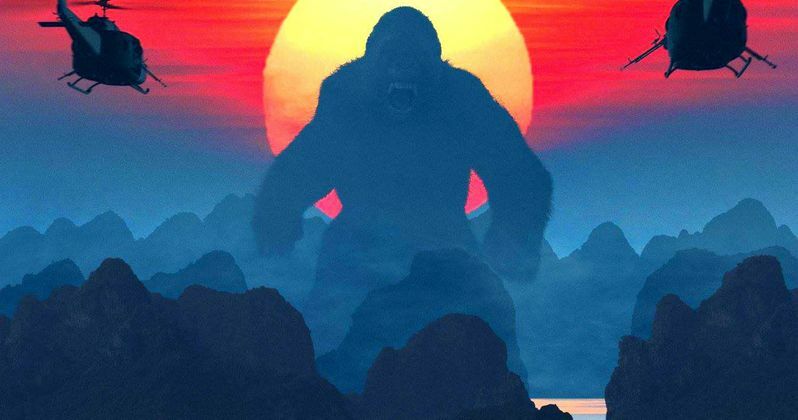 Now the trailer is here and we can now see just how different this version of King Kong is going to be when compared to Peter Jackson's 2005 version, which featured Jack Black and was over three hours long. Legendary Pictures and Warner Bros. are planning to pit this new version of King Kong against the current, rebooted Godzilla, who made his debut in 2014. This was by far the largest version of the monster we had ever seen on screen, so there were reasonable questions as to how King Kong could possibly compete. Well, the studio answered that question when they released a set photo showing a skull that teases the largest version of Kong that we have ever seen. The trailers and other photos we have seen have further cemented that this beast is truly massive. It is unclear how Legendary and Universal are planning to unite Godzilla and King Kong in the present, since Kong: Skull Island takes place in the 70s. Or they may have Godzilla and King Kong duking it out in the past as a prequel to the first Godzilla and a sequel to Kong: Skull Island? First, we need to see how this reboot of the King Kong franchise goes. If they can match the success of 2014's Godzilla, which grossed $529 million worldwide, then things should be good to go for the future monster fight. Kong: Skull Island, stars Tom Hiddleston (The Avengers), Brie Larson (Room), Samuel L. Jackson (Captain America: The Winter Soldier), John Goodman (10 Cloverfield Lane) as well as Straight Outta Compton co-stars Jason Mitchell and Corey Antonio Hawkins. The movie is being Directed by Jordan Vogt-Roberts, who directed the indie movie The Kings of Summer. It was written by John Gatins (Flight) and Max Borenstein (Godzilla). Be sure to check out the new trailer for for yourself below. Kong: Skull Island is set for release on March 10, 2017.